Lynn & Conor, 5th April 2019. We had our wedding in The Raheen Woods Hotel Athenry on April 5th. From the moment we met Frances we knew that our wedding would be everything we wanted. During the preparations she was always available to answer any questions or offer advice. On the day she was simply amazing, from fixing the veil, calming nerves and bustling the dress she really exceeded all expectations. The whole team at the hotel were so friendly, helpful and professional and as a result our wedding day was truly fantastic. Joanne & Brian, 12th October 2018. From the moment we met Frances; bubbly, warming and professional. She made choosing the Raheen Woods a very easy one. She went through in so much detail what Raheen Woods had to offer. She listened to our needs and our requests and did not disappoint. Frances efficiency and regular contact made the lead up to our wedding very stress free. On the day of the wedding we were so relaxed as we knew France, Oisin, Pawel and the Team would look after us, our families and our friends but they exceeded our expectations. Constantly checking in with everyone to ensure they had enough to eat, their exquisite professionalism serving the top table and the friendliness of all the staff both the night of the wedding, at reception and in the breakfast room. We can't thank you enough for how much you made our day so special. Thank You, Joanne & Brian. Amanda & Fergal, 24th August 2018. Fergal & myself were married in the Raheen Woods on Friday the 24.08.2018. Our very first encounter with Frances & staff we were hook line and sinker.... Frances, Lester, and Oisin could not have been more helpful and accommodating. We meet with Frances and within minutes I knew that this is where we would have our wedding day, She was so helpful and amazing in every way. We were so impressed by the service that all the staff provided to us on the lead up to our wedding day and the day itself. We never felt like just a number with the Raheen Woods, we felt that we mattered and that management and staff would bend over backwards to assist us in our planning and they did in every way possible. The location was perfect for both families & friends. The function room itself was perfect for our number of guests (220). It was big but yet cosy and intimate and also exclusive to the rest of the hotel. Reception area is perfect with a nice bar area. The food that was served on the day was nothing but delicious. It was vey hot, tasty and great presentation. There was no table left waiting and had plenty of everything. The staff were amazing and helpful to all the kids which meant a great deal to parents. The owner Lester was going around with gravy I mean that to me speaks volumes in a business now days. We have spoken with a number of our guest since the day and everyone has raved about the friendly and professional staff and the family atmosphere they experienced throughout their stay at the Raheen Woods. Guests have even said they will book a weekend back to Raheen Woods in the summer next year with their families as they were so impressed. I would highly recommend the Raheen Woods to any couple who are looking to get married. Frances, Oisin and Lester catered to our every need and request throughout the whole wedding process. We wanted our day to be perfect and we set our standards high as it is one of the most important days of your lives and I can honestly say that our expectations were met. Frances, Oisin and Lester, we are so grateful to ye for making our wedding day one of the most memorable days of our life. From the bottom our hearts thank you so much for everything. Eoin and I had a spectacular experience from start to finish on our Wedding Day. From our first meeting with Brian and Frances we were so impressed with the venue and with what it had to offer. A massive thank you to Frances, Oisín and the team for their fantastic work. Thank you for making our day special. Roisin & John, 30th June 2018. We picked the Raheen Woods as our wedding venue because of all of the little extras offered in the package. We had also been to a wedding there a few years back and really enjoyed our experience as guests. As a half Irish/half Scottish wedding we were delighted to see the option of a bagpiper came as part of the package!! We were not disappointed. We live in Scotland so planning a wedding from abroad could have been tricky but the Raheen Woods made it easy for us. We had a couple minor issues which we had to raise with the hotel during planning but in all our dealings the hotel staff were professional, courteous, and everything was resolved to our satisfaction. Frances in particular was an absolute star in the lead up and particularly the day before when the groom and groomsmen were setting up. She had great advice on the best way to do things and helped with setting up the tables the way we wanted but also in a way that worked for them. She even helped assemble our cake for us the morning of the wedding!! On the day the staff could not have been more accommodating to us and to our guests. Many of our guests’ feedback was on how great the staff were, always making sure everyone was happy. We had several guests with dietary requirements and they all reported being very well catered for. Our three-year-old nephew at one point had a meltdown during dinner and my sister said the staff were very attentive, seeing if they could help in any way. Our two-year-old niece was also asleep when dinner was served but the staff made sure to serve her dinner fresh when she woke up an hour later – a lovely gesture which wasn’t requested but much appreciated. We have had feedback from loads of our guests on how great the food was – both the quality of the dishes and the fact we were offered seconds of meat, veg and sauces. Guests also fed back on how great the cutting of the meat ceremony was with the head chef Paul. We cannot thank the staff enough for always seeming to go above and beyond to make sure our guests and ourselves were happy – even the following day, at breakfast and picking up our bits from the function room. Aside from the wedding; the suite, the reservation staff, bar, leisure centre and spa were all excellent. We are definitely looking forward to coming back to stay in the hotel again! Sara & Enda Moran, 23rd June 2018. My husband and I got married on the 23/6/18 and had our reception in the Raheen Woods Hotel. From our first encounter with Frances and Oisín we were very impressed with the venue and what it had to offer. Have to commend all the staff for the fantastic service on the day and the food was absolutely beautiful. Thanks for a wonderful day from start to finish and making our day special. Thanks so much Frances, Lester and all the staff at Raheen Woods for our fabulous wedding day.Ye couldnt have done enough to ensure that ourselves and all the guests had the best day possible.The food was fabulous, we loved the decor of the room and the way it was setup and all the staff were just amazing and were so friendly and helpful in everyway possible. We just can’t thank ye enough for giving us the most amazing wedding day and we will always be grateful for everything ye did for us. Ruth & Pat, 25th May 2018. Ruth and I were married in the Raheen Woods last Friday the 25/5/18, from our very first encounter with the staff and the location, we were blown away. Frances, Lester, Brian and Oisin could not have been more helpful and accommodating and they catered to our every need. We were so impressed by the service that all the staff provided to us on the lead up to our wedding day and the day itself. The location is beautiful and the food that we were served on the day cannot be matched. We have spoken with a number of our guest since the day and everyone has raved about the friendly and professional staff and the family atmosphere they experienced throughout their stay at the Raheen Woods. If anyone is the process of looking for their perfect location on their big day, look no further than the Raheen Woods and their staff. Frances, Brian, Oisin and Lester catered to our every need and request throughout the whole wedding process without query. We wanted our day to be perfect and we set our expectations very high and I can honestly say that our expectations were met and then exceed by a great deal. Frances, Brian, Oisin and Lester, we are so grateful to ye for making our wedding day one of the most memorable days of our life. Thank ye so much. Hazel & Peter McGuinn, 24th March 2018. Myself and Peter got married in the Raheen Woods on the 24th March 2018. From the minute we walked into our first meeting with Lester we felt at ease and also we felt like our wedding was very important to them, which is not a feeling we got in some other venues. We kept in touch in the lead up and then in the final few months we were dealing with Frances, she was exceptional, even giving us little tips for things to do on the day, so sensitive when dealing with any issues or worries we had, always replied so promptly and put us at ease. The day itself ran so so smoothly and I cannot tell you all the people that have commented on the venue, mentioning everything from food to service to cleanliness. The only problem is that we can’t do it all again! Thank you for everything! Hazel and Peter McGuinn. Geraldine & Tommy, 30th December 2017. I cannot praise Raheen Woods Hotel enough! They gave me and my Husband the best weekend of our lives!!! They treated us with such kindness & warmth from the very first day we met right up to our wedding day. Their professionalism was outstanding, they went over and beyond for us. I have to give a special mention to the fantastic wedding coordinators Frances & Lester. They made everything so easy, stress free and enjoyable for the both of us. All our guests complimented the service and food on the day of the wedding. It is such a fabulous hotel and the grounds are unreal for photos, especially ours 30th December with all Christmas decorations & Royal Tara Christmas lights outside. Natasha & Daniel, 29th December 2017. The Raheen Woods Hotel was the first venue we visited when we started looking for a wedding venue, and it was a very easy choice to make in the end as no other location came close to it. It ticked all of the boxes, especially having the private entrance and lobby area for our wedding guests. The hotel and the grounds are fabulous. Frances was such a great help to us right from the very first day we met her. Nothing was ever too much and she gave us great bits of advice relating to the whole day and not just the wedding reception. Everything was always well under control and completely organised. We have received so many compliments from wedding guests about the excellent food and professional top class service provided by Frances and all of the staff in the hotel on our wedding day. They went above and beyond their duties to make our day amazing and make sure all of our guests were very well looked after. Thanks so much to all of the staff for making our day so memorable and giving us the best day of our lives. We would highly recommend the Raheen Woods to anyone who is looking for a wedding venue. Robyn & Ross, 28th December 2017. We had our wedding in the Raheen Woods Hotel on the 28th of December 2017. Lester and Fran took time, care, and gave attention to detail when going through our requests and menu choices prior to the wedding. The Wedding was one of the most magical days of our lives. The management and all of the staff went above and beyond their duties with their care, attention to detail, and effort when it came to making us, and all of our guests feel totally looked after. Their table service was top class, the food was amazing and the room looked fabulous. All of our guests were gushing about how wonderful the food was, and how accommodating, and attentive all of the staff were. Jennifer & Paul, 29th September 2017. We initially viewed the Raheen Woods Hotel as a possible venue for our wedding on a close friends recommendation. It was an easy pick in the end, the personal touches even on our first meetings with Brian and the ease we felt had sealed it as our venue. The amazing attention to details, easy communication was very important to us as we were organizing our wedding from abroad. It was a stress free journey all the way. On our wedding day 29/09/17, the amazing hospitality, organization and little touches continued to ensuring we had the best day of our lives. I cannot thank all the staff enough including especially Lester and Brian, it was the most spectacular weekend full of laughs, amazing food and service, and all who travelled from Monaghan are still talking about their weekend in Galway. On 1st September we tied the knot in the Raheen Woods Hotel, Athenry. We were not very familiar with the hotel but it made a huge impression on us as we walked in the lobby of the hotel. It was just so clean, bright and spacious. Even though we were looking at a number of hotels I think we knew early on that we fell for the Raheen Woods! We booked in February after meeting with the wedding co-ordinator Frances, she was just so helpful and down to earth. She was very easy to talk to, listening to all of our ideas as well as suggesting some of her own. When Frances went on maternity leave Oisin took over, nothing was too much to ask. On occasion when we visited the hotel for a meal Oisin would ask if there was anything he could do for us regarding the wedding. We had a lot to do between February and September but we never had to worry about anything regarding the hotel, everything was taken care of. When it came to the big day, everything was in order. We had our civil ceremony in the beautifully decorated DeBurgo Suite. Everything was running smoothly until the bride couldn’t close the buttons on her gown, in steps the real hero, Lester, not all heroes wear capes! The meal was beautiful with many of our guests commenting on it and the seconds of meat and veg offered. The service was second to none, the staff all round were lovely and friendly. We are now returning to the Raheen Woods for our 1st wedding anniversary and it brings back such great memories. If we were to do it all again we would definitely choose the Raheen Woods Hotel. Well done to Lester and all the staff. For us Raheen Woods were the core part of the wedding team organising our day. This was no small undertaking with bride and groom parenting a 4 month old baby, a 2 year old and 3 year old flower girls. They accomodated family friendly appointment times in the lead up, switched to email and phone links any time we needed and responded so quickly that decisions never lingered. Our interactions with Frances and Lester were jovial and easy making the whole wedding organising fun and memorable. This was totally unexpected. They always took our ideas and grew them and never flinched at the requests that became more about young children than the wedding. The bridal suite was unbelievable in comfort,size and facilities. They accommodated varied diet requests, were fully accessible that allowed family member seamless access to all parts of our day without making them stand out in any way. The cleanliness of the hotel was flawless and the exceptional hospitality extended til the moment we left. The wedding reception, the food, the staff were magic. I felt like a princess for the day and yet was still able to be mom to 3 other princesses while enjoying all that a wedding can be. We hold our wedding day as an incredible memory for our family and friends and feel incredibly lucky that we choose Raheen Woods. We love this hotel, the atmosphere, the ease and the continued attitude will make sure your stay is wonderful. Having visited a lot of wedding venues around Galway in the lead up to our wedding, we booked The Raheen Woods within ten minutes of meeting Oisin on our first visit. The venue was setup for a showcase weekend and looked wonderful, the price was extremely competitive for what was being offered, and from talking to Oisin we knew from the start that anything was possible and everything would be organised to perfection. This turned out to be the case from start to finish. We wanted to have a certain involvement in tailoring the day to be a little more individual and everything we asked for was delivered without question, little things like allowing us to amend menu and timings, and dealing directly with some external suppliers on our behalf made the whole day a little more special for us while ensuring a stress free build up to the day. Over the course of our preparations we worked with Oisin, Frances, and Lester, all of whom were available, friendly, and accommodating at all times, and on the weekend of the wedding we had both Oisin and Lester constantly available to ensure everything went exactly to plan. On the day itself, I could not fault a thing. The room looked exactly as we had planned, the food was delicious with service efficient, the bar ran smoothly and efficiently all night, the residents bar provided a comfortable wind down area into the wee hours, and the wedding suite was beautiful. Outside the hotel, the grounds were in full bloom and provided a beautiful backdrop to our wedding photos. This is undoubtedly a high end four star wedding venue. Owen & Maria, 3rd June 2017. My wife and I had our wedding reception in the Raheen Woods Hotel in June 2017. From the very first moment we walked into the hotel during our search for hotels, we knew that this was definitely the hotel where we wanted to have our wedding. Everything about this hotel ticks all the boxes. The friendly staff are an absolute joy to deal with, especially our wedding coordinator Frances and Hotel owner Lester who gave us tips and ideas about the whole day that we wouldn’t have ever thought of. The food in the Hotel is fabulous (I think the only complaint from our guests was that they had TOO much food which speaks for itself). The function room is bright and modern and quiet spacious and having your own private entrance and lobby area makes this hotel stand out a mile from all the other hotels around Galway. I would recommend this hotel to anyone in a heartbeat, especially if they are thinking about having their wedding there. Thanks to all the staff in Raheen Woods Hotel for making or wedding day so special. Edel & Kieran, 2nd June 2017. Thank you for such a wonderful day that we will treasure and talk about forever. Sarah & Kenneth, 27th May 2017. There are hardly enough superlatives to describe how happy we were with our wedding in the Raheen Woods Hotel! From our very first meeting with Frances, to our walk around the hotel, to the food choices and menu tasting, to the room layout and decoration, to the room reservations and allocations, to the day itself we really couldn't have asked for better or nicer people to deal with. The Raheen Woods is a family run hotel and the homely feel they have created make it an asset to the locality. This homely feel goes hand in hand with the people making you feel right at home in the hotel. We were never in doubt as to how good our wedding was going to be leaving it in the Raheen Woods teams hands but they surpassed all our expectations and made our wedding day one we really will never forget and one our guests still compliment us on. I would not for one second hesitate in recommending the Raheen Woods for any event especially a wedding. We really didn't have one worry in the lead up to the wedding and that's down to all their professionalism and attention to detail. The Raheen Woods was the best decision we made in relation to our wedding and if we could we'd do it all over again! Geraldine & Aurelien, 6th May 2017. We had our wedding in the Raheen Woods Hotel on the 6th of May 2017. Frances, Oisin and Lester took so much time to talk to us, to make sure the arrangements were all that we wanted. Our wedding was a French-Irish fusion wedding and everyone at the Raheen Woods Hotel made it as easy and fun as possible from printing our menus in French to accommodating my father-in-laws champagne (!) to Oisin surprising us when we walked into the ballroom as husband and wife by introducing us in French and English. The level of service and attention to detail is second to none. Our guests still talk about how fabulous the wedding was from the hotel accommodation to the food to the wait-staff and management service. We had our wedding in The Raheen Woods on the 21st of April 2017. Our guests travelled long distances so we had a two night stay. We visited a few hotels but The Raheen Woods stood out. Thanks to Lester and Frances for all their helpful advice, guidance and any extras we asked for was never a problem. I have to say this is one of the cleanest hotels we have stayed in and it has a lovely bright warm atmosphere. Thanks to Lisa and Majella who were very courteous and helpful at all times. Also to Oisin and Paul for serving up a fabulous meal which guests commented on and the excellent service. And also the individual dishes that were served up for guests with dietary requirements. We can say the same for the second day/night. The outside grounds are very well kept and fabulous for photos. Lester, your team are a credit to you. Thanks to all for making our weekend so special. Lisa & Francis, 28th January 2017. From the moment we walked into the hotel we were made to feel at home and like we were the most important people there. The first day we went to view the hotel and discuss wedding packages Lester spoke with such enthusiasm about his work and what they could do for us. Nothing was too much. The hotel itself is fabulous. The grounds are kept so well and the hotel is spotless. All the staff we dealt with were extremely friendly and would go out of their way to help you. We got nothing but positive feedback from all our guests. We both work shifts so it can be difficult to schedule meetings but Frances always worked around us and met us when we needed her. We always walked away feeling that everything was under control and organised. On the day everything ran perfectly and all our guests were well looked after and happy. The food was exceptional and even the Chef took part in the celebrations. It was a fantastic day and that is all down to Frances, Lester and all the staff there. We could not recommend this hotel highly enough to anyone who wants to make their wedding day special. Matthew & Gillian, 29th December 2016. Matthew and I cannot thank the Raheen Woods Hotel enough for all they did for us from the outset of our wedding. We would like to thank Frances, Lester, Oisin and the entire team for all their help from start to finish with our wedding preparations. From the very first day that we went to view the hotel we were treated like royalty! Our minds were made up within minutes that the Raheen Woods was the dream hotel for our wedding. Both Matthew and I are from the locality and we had attended a number of weddings in the Raheen Woods Hotel and it was our first choice of hotel for our big day. Frances and the team were excellent...we were made feel like the only couple to ever get married, nothing was a problem for her and all our extra little requests were taken care of without a second thought. The words 'no problem' is what ever bride-to-be wants to hear and genuinely nothing was too much trouble for Frances, Lester or any member of the team. The staff were fantastic - everybody that was at our wedding commented on the attention to detail and how they were treated so well on the day. Our guests are still raving about the meal on the day of our wedding. We would love to be able to thank each of the team individually but hopefully this testimonial will suffice. We would do it all over again in the morning and we would change nothing about the day, in particular the fabulous wedding venue and excellent staff. Orla & Stephen, 23rd September 2016. We recently had our wedding in the Raheen Woods Hotel and can honestly say that from our first meeting with Lester, until past our wedding day, we received fantastic service from all involved. Both Lester and Frances guided us and advised us along the way and nothing was ever too much. All emails and telephones calls to them was responded back promptly and everything was explained in full detail. In the run up to our wedding day, we felt confident with the hotel and all the staff involved and our wedding day ran smoothly, thanks to the wonderful staff at the hotel, who went above and beyond for us. Since our big day, we have received endless compliments about the hotel, its bedrooms and the food at the wedding. We can honestly say we did not receive one negative comment. We ourselves had a fantastic day, thanks to Lester and his team and have already highly recommended the hotel to our friends. Sarah & Mike, 3rd September 2016. The Raheen Woods Hotel was recommended to us by a friend following our engagement so we said we'd add it to the list of possible venues. It turned out to be the first venue we visited in Galway when we started looking and to be honest every other venue we saw after it was not comparable. We got a lovely warm feeling about the place as soon as we arrived, the staff were lovely and so helpful. The building itself was bright and warm, the separate entrance for the wedding guests meant that the guests were all together and the whole function was private. Frances could'nt have been more helpful throughout the planning process, and towards the end she really helped to de-stress us. She gave great advice that related to the whole day not just the reception part. All the staff were really accommodating and were very helpful whenever we had any questions, they were very professional and friendly, this is something that was commented on by many of our guests. The food was delicious and we were delighted to hear our guests raving about the meal, they continue to compliment even now two months later. There isn't one thing that we can think of that we'd change about the venue, we had an amazing day in the Raheen Woods Hotel, thanks so much to all the staff there, you made the day very special to us. Joan & Kieran, 12th August 2016. We had our wedding in the Raheen Woods Hotel and I'm so glad we did. We called in after getting engaged and we were so happy that we booked our wedding here a full year in advance of when we had planned. Frances & Lester took such good care of us in the 18 months of planning and of course on the day itself. They really know exactly what they are doing and it was great that we could trust them with everything. They were always available whenever we needed them. On the day, all of the staff were great. They are so professional and all did an amazing job. The Night Manager, David especially went above and beyond for us, we will always remember what he did for us. All of our guests had a great time and we were very impressed with the food & drink. Overall, it was just perfect and I would highly recommend to anyone. Even call in and have a chat with Frances, there is no doubt she will make time for you. Lisa & Darragh, 5th August 2016. We celebrated our wedding at the Raheen Woods Hotel and we can honestly say it exceeded our expectation and hope we had for our big day. The morning after our wedding we woke up and instantly agreed we wouldnt have changed a thing - especially the hotel. The Raheen Woods Hotel is all about personal attention, we never felt that ours was just another wedding as we did in some other venues. They care and its shows in everything they do. Noreen & Kevin, 9th July 2016. Just wanted to share our wonderful experience at the Raheen Woods Hotel where we had our wedding reception. From the very first meetings with the wedding coordinator, the follow up meetings, the food tasting, all the advise and ideas, right through to the big day and afterwards, the hotel was excellent! Our experience dealing with Lester, Frances and all the staff made our day. The staff were friendly and helpful; the food was excellent, great selection and cooked to perfection; the hotel comfortable and spotless. Overall, they made life very easy for us with the way they managed the whole day and the build up to the wedding day. We have received so many comments from our guests about how great the hotel was and how good a choice it was. Just want to thank all of the staff for making our day. Amy & Darren, 6th May 2016. From the moment we walking into the hotel and met Frances, we knew we had made the right decision in picking Raheen Woods Hotel for our wedding reception. Nothing was too much trouble and Frances was always only an email or telephone call away. Frances made us at ease whenever we met and we cannot thank her enough for all the time she extended to us in planning our wedding day. On our Wedding Day, the attention to detail, the food, the service was second to none. We have received so many compliments from all our guests all commending the venue, the food, service and staff! We wanted to have a day that we and our guests would enjoy - we wanted to relax and enjoy the experience and we cannot commend Lester, Frances and all the staff for going over and beyond our expectations. Thank you to all from the bottom of our hearts for giving us the best day of our lives and one we will truly never forget! Majella & Padraic, 8th April 2016. When it came to choosing our wedding venue we looked around at numerous venues but they all seemed to be missing something. When we met with Lester for our show around at Raheen Woods Hotel it ticked all the boxes. Lester & the team offer something more than any other hotel we visited, you are made to feel like family and that your wedding day is just as important & special to them as it is to you. No request was too big they went above and beyond to ensure that we had the day we wanted our way. The entire team couldn't do enough for us through the planning process, always on hand to help. The food on the day was praised by all of our guests and the way the staff look after everyone so well. Lester, Frances, Oisin, Paul, Josephine, Lisa and all the team are a credit to the hospitality industry and the reason why this hotel offers that little something more, something really special. You will always be made to feel welcome at Raheen Woods Hotel even after your wedding is over. It's the kind of place that you will want to return for family celebrations time and time again. We loved every minute of our special day and are thankful that we chose Raheen Woods Hotel. Sarah & Oliver, 19th March 2016. Oliver and I cannot recommend the Raheen Woods Hotel enough for the perfect wedding venue. From the very first day that we went to view the hotel we were treated excellently and our minds were made up within minutes that it was the venue for us. Being a local Galway girl I had attended a few weddings in Raheen Woods Hotel before our engagement and I had always thought it was fantastic so I was delighted that Oliver loved it as much as I did. Frances and the team were excellent...we were made feel like the only couple to ever get married! Nothing was a problem and I had a lot of little extra requests. The words 'no problem' is what every bride-to-be wants to hear and genuinely nothing was too much trouble for the hotel. Whatever we asked for we got and loads more. On the lead up to the wedding from the meal tasting, room planning, table planning and many other finer details, Frances and Majella were most helpful in every way possible. On the day itself, everything was simply perfect. The staff were fantastic, they looked after every guest so well. The food was amazing, the service flawless, the room was beautiful, we really could'nt recommend the Raheen Woods enough. Frances, Majella and Oisin all did an amazing job in the lead up to the day and on the day. We would love to be able to thank each of the team individually but hopefully this testimonial will suffice. We would do it all over again in the morning and I would change nothing about the day, in particular the fabulous wedding venue. Thank you so much to the Raheen Woods Hotel....everyone should have their wedding there!! Carol & Darren, 5th February 2016. Darren and I cannot thank you enough for all of your hard work on the 5th February last which made our Wedding Day absolutely perfect in every way. We had looked at a number of venues but there was something unique about the Raheen Woods, that personal touch and professionalism, we knew this would be our perfect venue and we were so so right. From our first meeting with Lester & Frances to the morning after the Wedding, we have only great things to say about this fabulous hotel. Nothing was too much trouble for any of the staff on the day and all our guests are stil telling us how great the food and service was. The attention to detail was outstanding. The help and guidance we were given in the lead up to the Wedding was absolutely second to none. We honestly felt like the pressure and stress was taken off our hands. I had quite a lot of little extras (from a jumper cake to a life-size Mrs. Doyle cut out) but nothing was ever a problem. Frances often had suggestions that offered a different view to us, she is always ahead of the game and totally made us feel like the only couple in the world! Everything we were promised was fulfilled...and more! To each and everyone of the team, but especially Lester, Frances, Majella and Oisin, we cannot thank you enough for making our Wedding Day so memorable and special. Eimear & Ronan, 19th December 2015. Ronan and I cannot thank the Raheen Woods Hotel enough for all they did for us on the outset. When we first got engaged, there was no doubt in our minds where we wanted our wedding reception. Having been to weddings at Raheen Woods Hotel over the years, we always found that there was something very magical and special about the place. Its the perfect setting and ideal for photographs with beautiful interiors and fabulous grounds especially at Christmas time lovely outside lighting! We knew we had the best day of our lives but to hear that our guests had a fantastic time from start to finish was brilliant to hear. So much of this is down to Frances and the Team to helping us every step of the way towards having the perfect day. Donna & Kevin ~ 4th September 2015. We attended a wedding in Raheen Woods Hotel in 2012 and we were so blown away with the experience that we decided it would be too the venue of our wedding reception. We cannot speak highly enough of the venue and staff especially Frances who was on hand every step of the way. Six months on, our families are still talking about the service, the food and how amazing the whole day was. Sorcha & Mark ~ 22nd August 2015. Our wedding reception at Raheen Woods Hotel was nothing short of perfect. Our every wish was taken care of. The ballroom was emaculate, the food and service excellent and all of our guests raved about if for weeks after! The Piper really started the party off for everyone and all of the staff made sure nothing interrupted the festivities. Deirdre & Aisling ~ 5th September 2015. We viewed a number of venues before we decided to book our big day at Raheen Woods Hotel. We were looking for a suitable venue to have our Civil Ceremony and reception. On meeting both Frances and Lester, they were both warm, welcoming, professional and friendly and made us feel right at home. Over the course of the 18 months, Frances was always available to take the time to sit down and discuss ideas and thoughts we had about our special day. This advice was invaluable. Frances often had suggestions that offered a different view or solution to us. The attention to detail on the day was outstanding. As well as have our reception in the hotel we also had our ceremony in a room that was beautifully decorated. From early morning to late at night, Frances and her team ensured the day ran smoothly. We can honestly say that we both had a very relaxed and stress free day thanks to Frances and her team as they ensured our guests were looked after at all times. Our guests are still talking about the beautiful venue, the delicious meal, friendly staff and how efficient the service was on the day. We would like to say a sincere thanks to Lester, Frances and all the team for making our day so memorable. Bernie & Tom ~ 27th June 2015. What a day we had on our special day. From our first meeting with the lovely Frances back in October to the morning after the wedding, we have only great things to say about this fabulous hotel. On the day itself, everything just flowed so well thanks to Lester and Frances. The food was fantastic, comliments to the chef, and was served so efficiently. We would love to do it all over again and wouldnt change a thing about the hotel. We would like to thank from the bottom of our hearts, Frances, Lester and all the staff of the hotel for making our day the day it was, one not to be forgotten. Thanks again and look forward to visiting soon. Donal & Clare ~ 29th May 2015. We can't thank you enough for all that you did on the run up to our wedding and on the day itself. You are a breath of fresh air to have around when stressed! The day went perfectly and we know that is all down to you and the team. Everything from the set up to the food was exactly what was promised and delivered. So many of our guests complimented you...we can't speak highly enough of you. Thanks to all the staff who were on that night and especially to you. Donal & Clare ~ December 2016. Caroline Walshe & John Glennon ~ 1st May 2015. We just want to thank Frances, our wedding coordinator, for so much that you did on our day. You and your team were absolutely fantastic. The professionalism and effort shown was second to none so thank you from the bottom of our hearts. Our guests had nothing but good things to say about every aspect of the day. 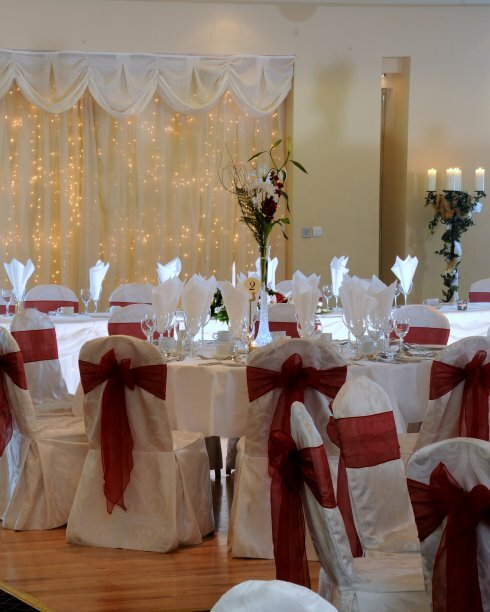 We wouldnt hesitate to recommend Raheen Woods Hotel as a wedding venue. What a perfect day....thank you! Deirdre & Kieran ~ 6th March 2015. We would like to thank you all for making our day so magical. Lester & Frances, you took the stress out of the wedding planning and preparation so that we could enjoy the build up to our wedding day. On the day Frances, you were 101 people rolled up into one. You had everything sorted and in place before we even asked. You were one step ahead of everything. You looked after us so well and in the evening time, Philip was there to look after us as well. To the Chef, the food was remarkable. Thank you also to the waiting staff and bar keepers. We had such a great day...thanks to all at Raheen Woods Hotel for making our day so memorable. We would like to say a huge thank you to Frances and everyone at Raheen Woods Hotel for all their hard work in making our wedding day so special. The wedding reception area was beautifully decorated and the meal was fantastic - everyone has commented on how good the food was. The only negative thing that we could say is that the day just flew by so fast. We wish we could do it all again. We will treasure all the memories of the day forever. We were married in St. Josephs Church in Galway City on a beautiful May day and after the customary formalities of meeting, greeting and photography, we made our way to the Raheen Woods Hotel in Athenry for the post wedding celebrations. Searching for the perfect wedding venue is like searching for a loving life partner, you just know when you find them and we were both instantly taken with the Raheen Woods Hotel, its location, setting and layout. We had looked at a number of venues and none of the felt quite right until we met Frances Doyle on Day 1 and she sold us a dream wedding. Frances, Lester and staff were brilliant throughout and their personal care and professionalism put the both of us at ease throughout the whole wedding planning process. You were always guaranteed to talk to Lester or Frances about any worry or idea you had on any day of the week and they both worked really hard to ensure you were happy with all your decisions. Access to the hotel in historic Athenry and its location just off the M6 motorway was a real winner for us and the decor of the hotel and wedding suite really sold it for us as it is really modern, unique, warm and inviting! Testiment to the professionalism and wedding planning process is that our wedding was the first of three weddings planned for that May Bank holiday weekend and from what we heard each and all of the wedding receptions were executed as per schedule and plan. Our arrival on the red carpet was greeted with loud cheering and applause by our wedding guests who were assembled outside in glorious May sunshine sipping on summer fruit punch and nibbling on fresh scones, jam & cream. There was time to mingle with our guests and soak up the joyous atmosphere before the dinner bell sounded. A particular memory for us was arriving into thunderous applause to the Pharrel Williams hit song, "Happy", as we stepped up to the top table. In the aftermath of our wedding, we were delighted to hear such positive feedback from family and friends about the venue, the food, craic and relaxed atmosphere at the Raheen Woods Hotel. So thanks to Frances, Lester and all the team at Raheen Woods Hotel, we have such fond memories of our wedding day! We felt so looked after and cared about and our friends and family all had a ball. We recently celebrated our wedding at Raheen Woods Hotel Athenry. I had heard so much about the weddings there prior to viewing the venue. We went to see the venue one evening after work & as soon as we saw the function room ( which at the time was mid week so wasn't set up for anything but wait until you see the lights ). Even the walkway down to the area weddings are held is so elegant & cosy at the same time. Our taster was very enjoyable & we were asked to write down any changes we may require, we had none! Finally our day came & everything was FABULOUS, the room was stunning, the piper added a great touch to our entrance. A lot of people said to us afterwards how hands on the management were on the day, which everyone loves to see. We have been to a lot of weddings & no hotel we have attended was a patch on Raheen Woods Hotel. For us it was close to my church so no one had too far to go, which people love, but we knew our guests were being well attended to until we arrived. Even if your not from the surrounding area Athenry is so easy to get to & no traffic across town. I hope in time I get to be a guest at a wedding in Raheen Woods, it really is a stunning venue, a hidden gem in Athenry. There was nothing I would have changed with the way Raheen Woods performed on our wedding day. Even the day after when we were ready to leave all of the flowers, cards, cakes etc were laid out on a trolley ready for us, no hassle. 100 % recommend this hotel as a Wedding venue & we are delighted they recently received their 4 star rating, well due! Lester, Frances, Majella & the rest of the Raheen Woods TeamWe cannot thank you enough for making our day so magical. We are so thankful to have chosen Raheen Woods Hotel as our wedding venue. From our first meeting with Frances, there was such a friendly, helpful yet professional atmosphere. Nothing appeared to be too much. We then met Lester to finalize the details and he proved to be open to new ideas and was interested in helping each couple have their day personalised. On the day, Raheen Woods Hotel were true professionals with a friendly approach to our guests. The service was fantastic and the meal superb. The little touches were magical and Frances was so attentive to both of us. The De Burgo Suite looked amazing and there was such a relaxed atmosphere which was carried throughout the whole day. We are delighted we made the right decision in choosing Raheen Woods Hotel and cannot recommend it enough. Dear Lester, Frances, Majella and Philip and all the staff in the Raheen Woods Hotel. Sitting down to write our review, it’s really hard to express on paper, what a magical day we had on the 21st June 2014. As the bride I can honestly say it was the most relaxed and stress free day of my life. I had every confidence in the team, from my dealings with them and rightly so. Lester was our wedding co-ordinator and pulled out all the stops; nothing was too much trouble for him, anything we wanted, we received, no trouble at all. Majella was inspirational, we had some fascinating conversations and she past on some great wedding ideas.When we arrived at the hotel, the piper greeted us, he was unbelievable, so many of our guests commented on how they had never seen or heard anything like him before. Lester and Frances greeted us with a well needed glass of champagne, and Frances thankfully was at hand to fix my hair, veil, dress etc. , as good as my mother (thanks Frances). Everything was superb, from the champagne reception, to the hotel décor, they had redecorated the hall and entrance area, keeping it secret, as a surprise for us (it was stunning), to the layout of the function room, the tables, the flowers everything it took our breath away. The food was absolutely delicious, our compliments to the chief, and they were over generous with the proportions, from start to finish, it was just amazing. Everything we were promised was delivered and more, much, much more, if the truth being told. Even down to the food at 3-4 am, which was scrumptious and very well appreciated, by all the remaining guests. To sum up our review of the Raheen Woods Hotel, it was definitely the best decision we made in choosing this hotel for our wedding day and to any upcoming brides and grooms trying to pick their wedding location we would highly recommend it, for its beautiful gardens (our pictures are amazing), the staff are spectacular and their attention to detail is just first class and its great value for money, so look no further than the Raheen Woods Hotel for your special day. Congratulations on your 4 star status! We went to see many hotels but the Raheen Woods, although a modern hotel, had a very homely feel to it. The booking itself was so easy as no request was too big or small and there was a range of menus to suit any budget. The staff were so friendly and accommodating and couldn’t do enough for us, especially Frances and Majella. The wedding day was amazing, people are still raving about the quality of the food and how much they received, some even went for seconds, of which there was no shortage of! One guest said it was the first time he was not able to eat the sandwiches later on. The lay out and décor of the room was absolutely beautiful. Thanks to all the staff for making our day so special. Most of our guests said it was the best wedding they were ever at. Some have gone back since to the Raheen Woods to eat out as they were so impressed by the food. We would like to thank the management and staff at the Raheen Woods Hotel for everything. When it came to choosing a hotel for our big day I have to say I would never have thought of the Raheen Woods it was only when we were thinking of hotels, it came up so we added it to the list. It was the first hotel we viewed and we felt that everything would be special. Anything we suggested to Lester was no problem, where other hotels told us what we could have. Before we booked the reception we did visit the hotel on several occasions and have to say the staff were also so friendly and helpful. Our wedding day was lovely we had the fine weather and the room looked amazing. Lester even wore a tie to match the bridesmaids! Every guest we spoke to couldn’t rate the hotel highly enough, they said the food was gorgeous, staff were so helpful and the décor of the hotel was fabulous. Lester, Frances, Philip & Jonathon were on hand on the day and really made us feel at ease. In saying that all the staff were so helpful nothing we asked for or wanted was an issue. Myself and Ronan were so happy that we choose the Raheen Woods Hotel to celebrate our wedding day. The management and staff were excellent, so helpful and friendly and delivered a top quality service to us and our guests. The venue was beautifully decorated and the grounds and flowers around the hotel are absolutely picturesque, our photographs showed this. The amount of guests who told us they asked for seconds with the food just proved how delicious the food was. The space for dancing in the room was ideal and the room was really beautiful very special with the flowers and candles. Alot of people complimented on how well designed and up to date the hotel is kept. The bedrooms are fantastic and so comfortable. The whole wedding package was really reasonable and had a lot to offer. We made an excellent decision in choosing the Raheen Woods Hotel and thank you once again to all the staff and management for making our day so special. Our decision to have our wedding at Raheen Woods Hotel, was the best decision that we made. Frances made the planning process so enjoyable and easy, and we had the most amazing day of our lives. The meal was top class; our guests are still talking about the food which arrived in the residents bar at 4 am. Our only regret is that we can’t do it all over again. We cannot recommend the Raheen Woods Hotel highly enough as a wedding venue! We have received such praise about the helpfulness of the staff and the overall quality of the hotel. Frances was so helpful and professional accommodating all our little personal touches as well as making great suggestions to help our day run smoothly which made us feel like our wedding was unique and important to them - not 'just another event'. She took a genuine interest in making our day personal and special to us. Lester, Maija and Philip ensured our reception ran smoothly. We were left to enjoy our day without worrying about things getting done- we were in good hands! There was no hint of stress and everything was completed to a high standard. They laid out our placenames, favours and personal touches beautifully and all with smiles! The accommodation was beautiful and housekeeping and reception staff went out of their way to help us enjoy our stay. Josephine on reception took personal interest in our guests and we had great feedback about the genuine and helpful reception staff. With lots of our guests travelling from South Africa we were pleased they were so well looked after at the Raheen Woods. We remain very greatful for that. So, a great big thank you to everyone for going the extra mile for us and we look forward to returning for our one year anniversary dinner! We have nothing but high regards for you and your team, from start to finish. Your knowledge and experience gave us so much help, with you being so friendly, that made us both feel exclusive. You went out of your way to accommodate for everything and beyond our expectations for and on our wedding day. All our guests thoroughly enjoyed themselves, and the food was absolutely amazing, the best lamb I've had for a long time. Frances, our day was beyond perfect, if we could relive that day, there would'nt be one thing we would change. As I said in my speach, a massive thank you to you and all your staff for the best day of Eugene's and my life. Many wishes for the future to you and Your Team Frances, and I would always recommend Raheen Woods Hotel as a venue for any future weddings. We would like to thank the Raheen Woods Hotel for all their help in the planning process of our wedding day and on the day itself. Both myself and John found all the staff so helpful and friendly, we are so glad we chose the hotel to celebrate our marriage. Our day was so personal and intimate for the family meal, and the De Burgo Suite looked amazing for the evening party. When I walked into the Deck area were we had our intimate family meal, I was blown away by how nice it looked, I never expected it to look so fantastic. All our guests that stayed in the hotel thought the rooms were lovely and in particular we heard great comments about the bar food, everyone had a really enjoyable weekend. I couldn't fault the hotel. Looking forward to a return visit to re-live some of the great memories. We would both like to thank Raheen Woods for making our special day so perfect in every way. From the first day we met Lester we had no worries at all as he had everything taken care off. We were always treated in a very professional manner by all the staff especially Majella on reception who was very helpful at all times. We will never forget walking into the function room on our own & seeing how it was set up on the day it was just beautiful. There was lots of other lovely little touches around the hotel that our guests just loved. The meal was just perfect couldn't fault it & the atmosphere in the room was just lovely it really made our day. A special thank you to Frances she is just amazing to deal with she thinks of absolutely everything & from the minute we arrived she was there to make sure we didn't have to worry about a thing! We cannot recommend Raheen Woods highly enough it is a perfect venue for a wedding. We are so delighted we chose Raheen Woods to celebrate our special day thanks again to you all its a day we will never forget. The Raheen Woods made our wedding blessing and reception a dream come true. The quiet efficiency and responsiveness of the staff there ensured that we had a very stress free experience. Meetings with the Wedding Coordinartor's were structured and informative each time prior to the event. Meeting with Frances in particular made the pre-planning fun as well as less daunting. On the day itself, we were informed and supported at all times during the day. One guest whose Passcard was left in a local store was faciliated to have it returned quickly by one of the staff team. This and other accounts of staff going above and beyond were common from guests which made the day all the more welcoming and special. We would like to sincely thank everyone for their help and all that was done to make our day extremely special. Thank you Lester, Maria, Frances, Philip and all the team at the Raheen Woods for making sure that we had a fantastic wedding weekend. When we first came to visit Raheen Woods soon after we got engaged we immediately knew that this was the place that we wanted to bring our family and friends. From that first visit and right up until we said goodbye to you all after the wedding we were struck by how the Raheen Woods and its team were so friendly, welcoming, warm and yet so professional. That is a difficult balance to strike. Nothing we asked for was a problem and at that you all went the extra mile. Our Wedding was over St Patrick's weekend. You took all the pressure off us with putting up all the decorations. What I noticed on a couple of occasions was that you all seemed to be enjoying yourselves as much as we were. The food was tip top, ontime, and the service was second to none. We had decided that we would continue the celebrations the following day in the Purple Lounge and the Buffet food went down a treat. And thank you so much for the way you accommodated a few late comers with some dinner. We could go on but really we just want to thank you sincerely for all you did for us, for making our Wedding weekend so perfect and for the welcome you gave our family and friends. 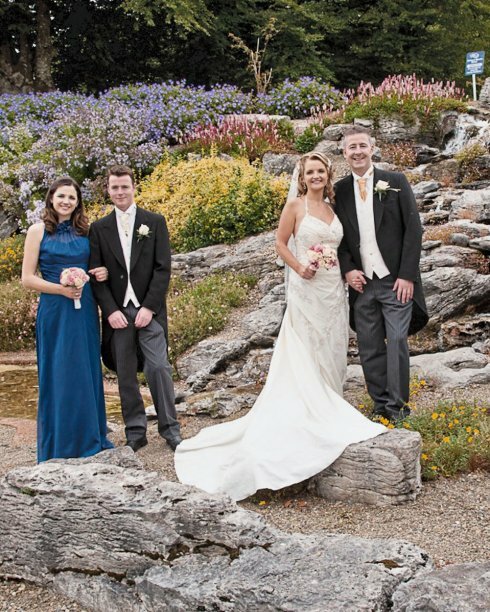 We would recommend the beautiful Raheen Woods to any couple. You are guaranteed a personal and professional experience that is hard to find. We hope this note extends a sincere thank you to Lester, Frances, Majella and all the Staff at Raheen Woods Hotel for all the work and effort that was done for us in the run up and throughout our wedding day on New Year’s Eve 2012. We were so pleased to have chosen the Raheen Woods as our Venue. Organizing the wedding from Boston made our job a little harder and it definitely would not have happened without all of your help, loyalty and support! Both we and our guests were blown away by the function room set up and the attention to detail all around the hotel. The excellent quality of our meal and the overall atmosphere that was created for us will never be forgotten, our guests still rave about all of it! They were truly impressed and this really made our wedding reception/day everything we dreamed off and more. We would not hesitate in recommending the Raheen Woods Hotel as a perfect wedding venue. Our day really was magical and we will always be thankful we chose your hotel. Planning a wedding in Ireland while living in England could add some extra pressure on a couple, but Frances was an absolute dream to work with. She responded to every email, phone call and visit with excitement enthusiasm and professionalism which honestly made us feel we were the only couple to ever wed at RWH. On the day itself I was overwhelmed by Frances, Lester & Paddy's attention to detail with every aspect of the reception, from Frances' amazing knack at remembering all my nearest and dearest names to Lester offering to drive my mum's dress to Galway to have it pressed...! Every single guest commented on how superb the venue & staff were and were especially complimentary of the food- This was truly outstanding and they were certainly well fed- Many of them having second and third helpings! With many of the guests staying for 3 nights- The hotel were certainly tested with our late night staying power....But even on the night after I cannot thank the staff enough for the continued attention and kindness to all our guests. We really couldn't have picked a better venue for our reception or got the warm welcome and service from anywhere else. The team really are a credit to the hotel. We would like to thank you all so so much for an absolutely amazing day at the Raheen Woods on our Wedding Day on the 15th September 2012. We had been to see many wedding venues between Cork and Galway and I never thought in a million years I would be getting married in Athenry but from the minute we stepped inside the hotel we were blown away by the warm and cosy atmosphere and how friendly all the staff were. It had everything we were looking for in a wedding venue, beautiful surroundings, modern decor and best yet it was practically on our doorstep! Thank you all so much for all your help in the lead up to the big day. It was a great relief to know our questions would be answered promptly over the phone any time of the day. Your advice and help was invaluable to us, allowing us to put our own personal stamp on the day. Thank you so much for your suggestions for photo locations such as the train station in Athenry and the band Amazing Apples, we were delighted with them and would have certainly missed out had you not mentioned for us to check them out! We had a fantastic day and have had many compliments from our guests on the hotel, the wonderful food, the service and in particular how friendly all the staff are. We were organising our wedding from the UK & took one trip to Ireland to see some hotels & from the very first moment, the Raheen Woods Hotel stood out from all the rest. We turned up unannounced as we had some extra time before viewing another hotel & the welcome couldn’t have been better. The hotel is a perfect combination of modern & cozy and the wedding reception area is set off to the far end of the hotel, so it’s feels like you have the whole place to yourself. From start to finish Frances made sure that the whole process was stress free, it didn’t evenfeel like we were organising a wedding, they took care of everything for us. Maija on reception was so friendly & helpful, keeping us regularly updated on the status of the room capacity & even helping put together our table plan & names for the big day. We & many others stayed at the hotel for the week/few days leading up to the wedding and the staff ended up more like friends, with John & Paddy helping us wind up other members of the wedding party. It sounds like a cliché, but the hotel made us feel like their sole priority for the lead up & for the big day, despite the fact that they would have many other weddings to organise. The service on the day & the quality of the food was amazing. To this day, we gets so many comments from our guests complimenting how great the hotel & service was. The Raheen Woods was never a Hotel I would have considered for my wedding. We attended a wedding fair and happened to pass the stand for the Raheen Woods. We stopped to be polite and decided to go to the hotel for a look. I have to say I was absolutely blown away. The attention to detail not only from the Wedding Co-ordinators but also from the staff involved was amazing. If I was stressed about something or I had a query I would ring Lester and it was sorted straight away. It was so comforting to know that it would be done immediately and most importantly done correctly. Thank you so much for all the help we received in the months leading up to our big day, nothing I asked was too much trouble. The service and attention we received on the day was second to none. The food was absolutely excellent and the feedback from all our guests has been so positive. The service during the meal, at the bar and in the residents bar was exceptional. Both the venue and room looked fabulous. Nothing was too much trouble for any staff member. Having you both present throughout the day was much appreciated and was a lovely touch. Frances, thank you so much for staying by my side it made my day so much easier. Lester, thank you for all your help, assistance and advice. You provide an excellent service, excellent food and the personal touch is what really makes a difference. We had a wonderful day and I want to say a big thank you to each and every one involved for making our day so special. We often go to the Raheen Woods now for lunch or dinner and I have to say the service and food is still excellent. When we got engaged we chose to look at three local hotels to see which one we would decide on. After our first meeting with Frances in RWH our minds were made up! She had been so friendly, helpful and forthcoming with ideas to make our day special before we had even signed on the dotted line! With the months upcoming to our wedding day we would meet to finalise different things. The hotel was so willing to help with whatever we needed even down to Lester showing our mothers the bedrooms and wedding suite. On our wedding day when we got to the hotel after the ceremony Frances became my fourth and most needed bridesmaid. Helping with my flowers, my veil for photos, she was amazing! Our day went off without a hitch, the reception was lovely. The meal was fantastic, the drink was kept flowing for our guests. All of our guests have nothing but positive comments for the hotel and staff. Its a tough decision having to pick a hotel but RWH is the right choice! 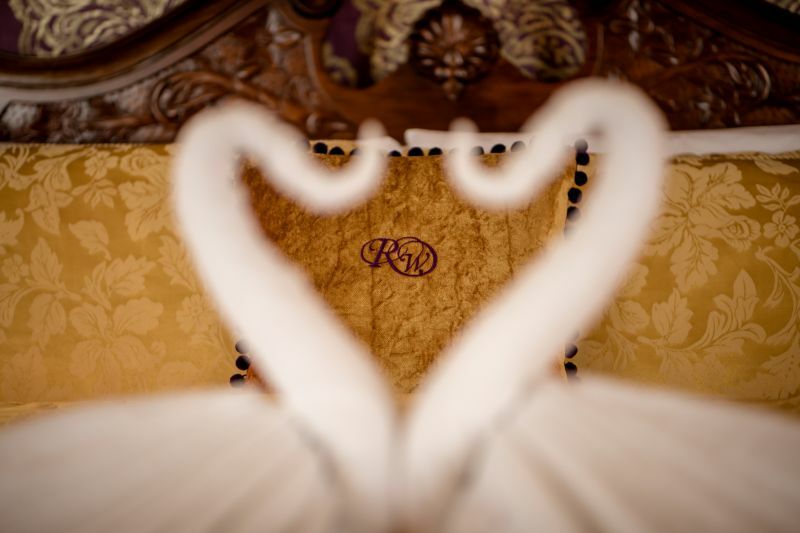 We would thoroughly recommend RWH to anyone looking to book their wedding there. It was an amazing experience and day in a fantastic hotel that deserves much recognition and thanks. Thank you all so much. Mr and Mrs Murtagh McGrath. From the moment we got engaged, I knew that I wanted something a little different when it came to the style/theme of my wedding-I wanted a vintage/rustic theme.We started to look at Wedding hotels around Galway but nothing was fitting the picture I had in my head of my dream day. Raheen Woods Hotel was recommended to me by someone I knew and as soon as we met Frances and had seen the beautiful hotel and surroundings I knew that this was the hotel for our wedding.Frances made it seem like nothing was impossible and for sure our expectations were met in everyway even though some of my requests were a little different and crazy. As I was having a rustic/vintage theme I wanted to use my own decoration and put my own stamp on the reception room to tie in with my theme. The hotel staff were wonderful, especially Frances who couldn’t have done enough to help assist us with everything in the run up to our big day. On our wedding day, when I actually saw the room, I nearly cried, as I didn’t think it was possible to achieve exactly the dream picture I had in my head of how I wanted the room to look. Such great attention to detail was paid by the hotel staff to make sure everything was perfect and exactly how I wanted. On a personal note, Frances was wonderful on my wedding day…not knowing where my overnight bag was and in desperate need to freshen up; she had a little bottle of deodorant within minutes and even perfume. It was such a personal touch. The food at our wedding was exceptional, our friends and family are still talking about it. Our guests also commented on the staff, that they were so helpful in a very personal but professional way, little things from taking photos at tables to driving guests back to their B&B’s in the early hours of the morning. We also stayed in the hotel the next night, along with some of our friends and family. Again the hotel staff and bar staff couldn’t have done enough for us, being so helpful and efficient. Also a very special effort was made to bring my theme into the decoration of the tables in the bar the second night, which was not something I requested. Without me even thinking of it, they brought out all my wedding centerpieces, candles, flowers etc. again to our area in the bar where we had fabulous food and even our own speaker for our iPod and a microphone. They even had my guest book left out again for people to sign. As much as I have tried, it is really hard to put into words how wonderful our weekend was in the Raheen Woods Hotel. All the hotel staff work together so well and are such a team. They really made us feel so special and have given us the most wonderful memories of our dream day.My friends described it as the nicest hotel they ever stayed in and one of the best weekends of their lives. I highly recommend this hotel for anyone’s wedding as they go above and beyond to make your day the very best! Thank you so much to Frances and Lester and all the staff at the Raheen Woods Hotel. What can we say only a huge THANK YOU to each and everyone of ye who made the 28th of July so special and without a doubt a day we will never,ever forget! From the beginning we knew we were in safe hands and from the initial booking to the actual day we felt very welcome and truly special! Nothing was ever impossible and ye were always there with big smiles and more than helpful to fullfill our dreams. The food, service and attention we received on the day was second to none. Our guests are still talking about the beautiful food, the stunning DeBurgo suite and the friendliness of your staff!! The attention to detail was outstanding and the feeling we got when we walked into the function room on the day took our breath away! Dear Frances, Lester and all the wonderful staff at the Raheen Woods. Sorry it’s been so long but life has been non-stop since our wonderful wedding day. Mark and I visited the Raheen Woods hotel whilst on holiday in Ireland it seemed the perfect venue for our wedding. Planning our wedding from England was made so easy by the team at the Raheen Woods. We travelled from England and arrived at the hotel on Wednesday 6 June and from that day onwards the whole experience was absolutely fabulous. Our friends and family arrived from England over the coming days and everyone without exception remarked on how wonderful the hotel and facilities were, but most of all were impressed by how friendly and helpful the staff were. They went out of their way to make everyone feel welcome and could not do enough for myself, Mark and our guests. As the wedding day approached Frances and the team remained completely calm and focused which helped Mark and I relax and enjoy our stay knowing that our wedding day was on track. As the wedding day dawned they even arranged for a beautiful sunny day, that’s what I call service! The hotel and De Burgo suite looked absolutely stunning as we were joined by our friends and family from Ireland. The day that unfolded I can only describe as magical! The venue, the food, the service could not be faulted and the craic was mighty! At the end of our epic day we retired to our fantastic honeymoon suite and enjoyed a blissful wedding night together. We were all sad to leave the Raheen Woods, and I am sure that many of our friends and family will be back there before long to experience your wonderful hospitality once again. None of this would have been possible without Frances and the team and we would like to thank you from the bottom of our hearts for making our special day unforgettable, not only for us but for all our wedding guests. It is really hard to put into words the magical day we had in the Raheen Woods Hotel on the 27th of April 2012...so here it goes! We can honestly say as soon as we stepped inside the door we knew instantly this was the venue for us! The managment team are truely one of a kind and we don't think any other hotel could match their expertise and professionalism. Knowing that we were in the safe hands of Frances took away the stress factor that comes with planning the big day. The day finally arrived and what an epic day was had by all...being greeted by the piper upon arrival, the champagne reception, the amazing De Burgo Suite that drew gasps from our guests as they entered, the devine food (they are all still talking about "the pudding"), and all the waiting staff who were so friendly, helpful and efficient. We would like to thank all the staff at the Raheen Woods for giving us a day that we will never forget, we are still in awe with all you did for us - truely above and beyond!!!! We really appreciate all the time, hard work and effort that went into making this day so special. We can't thank you enough and we are more than happy to recommend the hotel to any couple who are thinking of holding their wedding reception at this breath taking location!!! Paul and Lisa Holland "Mr and Mrs H"
After viewing hotels all over Galway and beyond we came upon the Raheen Woods after taking a short detour from our usual M6 travel. On our first visit we meet Lester and were shown the private entrance, private lounge and immaculate reception rooms. There was no big sales push and we were left to our own decision, which was a very easy one. After booking we meet with our wedding co-ordinator Frances who ensured the entire planning process ran extremely smoothly. If you are like us and know nothing about the entire wedding process then the Raheen Woods and the ever helpful Frances is the place for you, she goes above and beyond the call of duty in ensuring your day goes without a glitch. The staff, Frances, Lester et al, are the most down to earth, courteous and genuine people you can meet. They will ensure that you do not lose sight of the fact that it’s ‘your day’. The food was exceptional and when they tell you that they are not stingy with the portions they mean it, one guest had the beef and when offered more veg he actually opted for the fish dinner as seconds - it was provided! I suppose the biggest compliment that we can give is that guests, from both sides and spanning different generations commented that this was the best, most relaxed wedding they had ever attended. The Raheen Woods owners and staff can be thanked for their part it making this happen. We can honestly say that there was not even one minor glitch in the entire day – leave all your worries behind and book the Raheen Woods, we personally guarantee you will not be disappointed. We visited many hotels on our quest for the perfect venue for our wedding...however as soon as we walked into the Raheen Woods Hotel we knew we had found our dream hotel. From the moment we booked the hotel with Lester we were treated like a royalty!! We held our wedding on 17th December 2011 and as with all couples getting married the bride & groom worry that everything will be perfect on the big day....all I can say is that if you book your wedding at the Raheen Woods the only thing that may not be perfect is the weather!! The piper lead us into the champagne reception which truly was unforgettable. Both the reception area & the De Burgo Suite were beautifully decorated as was all other areas of the hotel...the different colour lighting really was amazing. The food, service and attention to detail was exceptional...many of our guests had not attended a wedding here before and they loved every minute of it...especially the black pudding salad. Each and every staff member went above & beyond the call of duty, this was especially evident when one of the guests looked for more beef after the dessert was served...they were presented with a plate full of beef. We let off chinese lanterns after the meal, Lester & Paddy were brilliant helping all the guests light the lanterns. Frances was at our side from the moment we entered the hotel and anything we requested was greeted with a smile and seen to immediately. We had a "Sweets & Treats" table for our guests and the staff had no problem setting this up & keeping it topped up!! Also the finger food we got at the Resdients bar went down a treat at 3am. As we got married before Christmas we didn't go on honeymoon until after Christmas so we had a mini-moon at the Raheen where we stayed for 3 nights. Although the wedding day itself was over the treatment we received from the hotel staff during our stay was top class and they couldn't do enough for us...even when we were getting the train into Galway Lester offered to drop us to the station!!! Now that the big day is over we look back on it & we are delighted to say that we would not change one thing. We really had the best day of our lives and that is all down to the amazing team at the Raheen Woods.